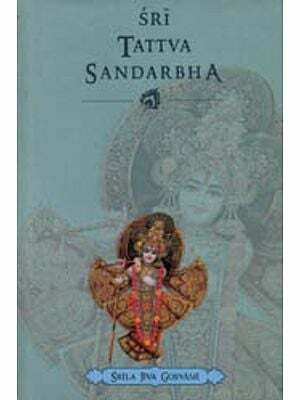 In the Krsna-sandarbha itself, second-to-last text, the purpose of the book is very succinctly stated: The description of sambandha – the relationship between and individual living entities and the Supreme Personality of Godhead. There is also a very interesting section dealing with evidence from the Bhagavad-Gita that Sri Krsna is the original Personality of Godhead. I remember studying Bhagavad-Gita many years ago and wondering why Sri Krsna often referred to Himself in the third person. For example: O scion of Bharata, surrender unto Him utterly. By His grace you will attain transcendental peace and the supreme and eternal abode (Bhagavad-Gita 18.62). Here, Srila Jiva Gosvami explains that the reason for this is that Sri Krsna is referring to His expansions and not Himself personally. 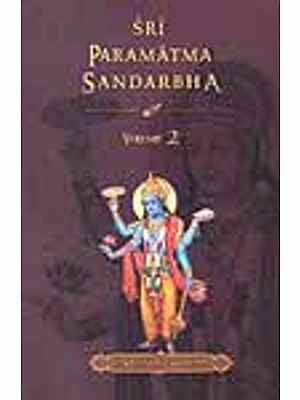 A vivid example of how the expansions of Sri Krsna consider Themselves so be individual personalities is also presented in this volume in the story of how Sri Krsna were, along with Arjuna, to see Lord Maha-Visnu, to recover the dead sons of a brahmana. Brahma explains: "... I am most humbly praying at your lotus feet for you to please give me any sort of birth within this Vrndavana Forest so that I may be able to be favored by the dust of the feet of some of the devotees of Vrndavana. Even if I am given the chance to grow just as the humble grass in this land, that will be a glorious birth for me..."
In this, the Second volume of this edition of Krsna-sandarbha, Srila Jiva Gosvami begins by showing that Lord Balarama is the original expansion of Lord Krsna and thus equal to Lord Krsna, and not a minor expansion, as many would have us believe. 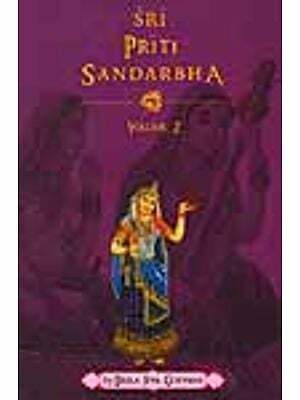 Lord Balarama is the origin of Lord Sankarsana, and not an expansion of Sankarsana. Next is discussed how Pradyumna, the son Lord Krsna, is not the same as the Visnu-tattva Pradyumna, but is the material demigod, Cupid, who was burnt to ashes by the anger of Lord Siva. Then it is discussed how Lord Aniruddha is one of the catur-vyuha expansions of Godhead, and not an ordinary living entity. Essentially, what Srila Jiva Gosvami demonstrates in this section of the Krsna-sandarbha is that Sri Krsna is the original Personality of Godhead, and when He appears in the material world, all other forms of Godhead appear within His form. Thereafter, the author proves at great length that the form of Sri Krsna is eternal, and the supreme form of godhead, and not temporary manifestation assumed simply for the purpose of incarnation, as the impersonalists might suppose. After proving how the form of Sri Krsna is the original form of the Supreme Personality or Godhead, the author provides evidence for the fact that the abode of Sri Krsna, Goloka Vrndavana, is the highest abode in the spiritual world. In the course of this discussion, it is conclusively proved that the abodes of the Lord in this material world, where He comes to display His eternal pastimes, are non-different from the His abodes I the spiritual world. That is to say, the Lord's abodes that are manifested in this material world are eternal, although this cannot be appreciated by non-devotees. Next, the author informs us that the associates of the Lord that appear on this earth are the eternal associates of the Lord in the spiritual sky. Although there are some living entities being promoted from the material world to the spiritual world, the Lord's eternal associates accompany Him as He incarnates upon the earth. Just as the appearance of the Lord is transcendental, so is the appearance of His eternal associates. 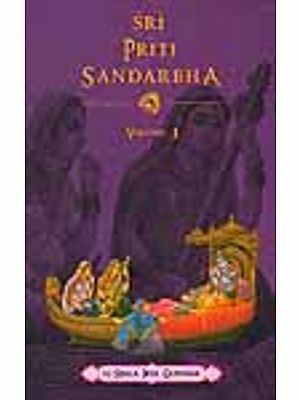 Meditation upon Lord Krsna is described in this volume of Krsna-sandarbha with many references of Brahma-samhita. All the incarnations and expansions exist simultaneously in the body of Krsna, who is described as two-handed. In this book are also descriptions of the Goloka planet, Vrndavana – the eternal place of Krsna, the identity of Goloka and Vrndavana, the eternal associates of Krsna, the quality of the manifest and Unmanifest pastimes, Sri Krsna's manifestation in Gokula, the queens of Dvaraka as expansions of the internal potency, and, superior to them, the superexcellent gopis. There is also a list of the gopis names and a discussion of the topmost position of Srimati Radharani. In the Sri Caitanya-caritamrta of Srila Krsnadasa Kaviraja Gosvami, there is mention of the literature compiled by Srila Jiva Gosvami: Sri Rupa Gosvami's nephew, Srila Jiva Gosvami, has compiled so many books on devotional service that there is no counting them. In Sri Bhagavata-sandarbha, Srila Jiva Gosvami has written conclusively about the ultimate end of devotional service. (CC Madhya 1.42-43). Anuccheda 90 text 4 – Anuccheda 106 text 25. Anuccheda 106 text 26 – Anuccheda 116.